I had just purchased six piping-hot, 8-inch rice-and-porkers at the Sausage Link on old U.S. 90 in Sulphur, Looziana, when I glanced down at the newspaper rack by the exit door and spied a surprisingly familiar sight in this almost-alien swampland. Had I drunk too much beer at the Kaw-Liga bar down the road, where I had eavesdropped on the locals debating whether an actual wildcat had killed old man Guidry’s horse? Or was I really seeing what I was seeing? The cover of the freebie magazine on the rack featured the photo of a man gripping sticks from behind a drum kit, namely “Lightning Mitchell” of Lake Charles, with the headline reading: “He’s Been Jamming With the Legends for Over 60 Years. Now He’s Chilling With Us.” I shamefully did not recall having heard of Mitchell before, but the article informed me that he was the drummer on Phil Phillips’ immortal “Sea of Love” and Boozoo Chavis’ pioneering zydeco landmark, “Paper in My Shoe,” and had played with the likes of Katie Webster and Lil’ Alfred. But what had made me do my surprised double take was the striking poster on the wall behind Lightning: “Mystic Knights of the Mau-Mau.” It was the Ponderosa Stomp poster for Year #2 (2003), with its roll call of legendary names like Billy “Boy” Arnold, Jody Williams, Henry Gray, and all those usual suspects. You had better bet your ducktails that Lightning Mitchell is a fan of the Ponderosa Stomp—and vice versa. 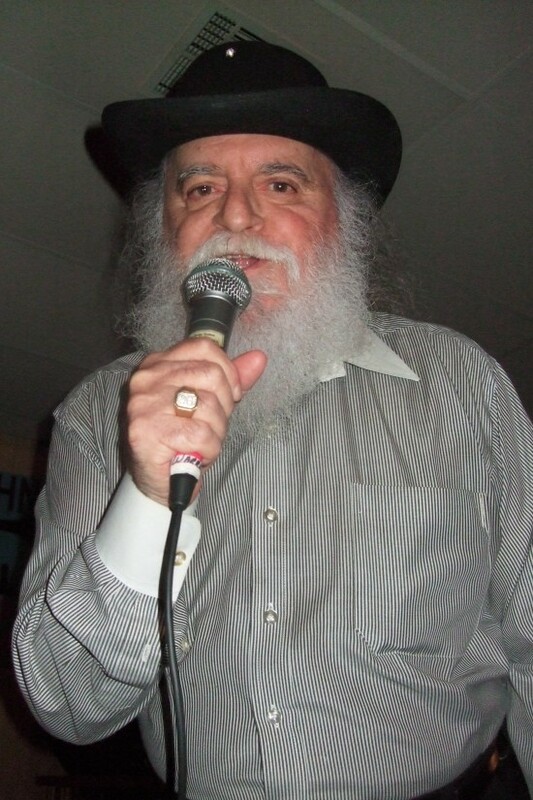 I was on my way to the VFW Hall in Starks, LA., near the Texas border, for a star-studded and certainly very Stomp-like bill: Warren Storm, Willie “Tee” Trahan, Tommy McLain, TK Hulin, and Charles Mann. The occasion for such an illustrious lineup was the Jack W. Johnson Memorial Dance. 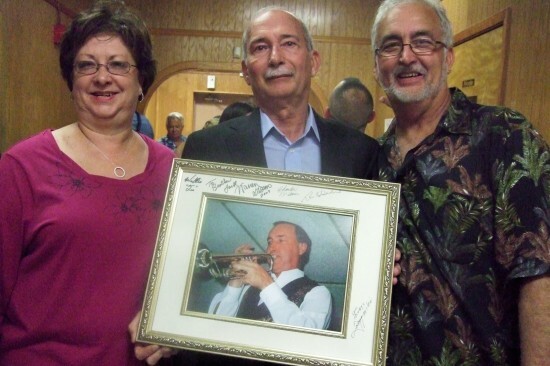 Jack had been a trumpet player for Louisiana Express, one of the go-to backing bands used by all the swamp-pop legends, such as those playing this show, as well as Lil’ Alfred, Johnnie Allan, and many others. But at the VFW Hall, after Warren Storm informed me that Don wanted to meet the guy who had come all the way from the Crescent to Calcasieu, my trepidation immediately dissipated. Don took one look at the tricked-out embroidered rooster ballcap on my head, smiled, and held up a hand to reveal a scar running at least 7 inches from his palm up his arm. “Steel-spurred rooster got me 20 years ago,” he revealed with a twinkle in his eye. Pumping his scarred right mitt, I knew then that Don and I were 100% simpatico. And as the music started, we were immediately transported back to the late 1950s, when the U.S. dollar was as good as gold and swamp pop was king. The VFW Hall was jammed with booted, cowboy-hatted, and Hawaiian-shirted dudes and their dates, who were dressed to the nines and smelling like perfume factories, drowning out the faint industrial reek of nearby Sulphur and Lake Charles. This was the hottest ticket in town. The only minor disappointment of the night was that our reserved seating at a long row of tables was so packed with Cajun and Texan flesh that we opted to stand for most of the night just offstage near the merchandise table, around which the headliners were seated like so many Cabinet secretaries or heads of the five New York famiglias. So though we mostly stood, we were near enough to touch the hems of their godlike garments. And moving away from the hoi polloi’s tables might have been a lifesaving strategy. With so many rabid dancers coming and going as the band shifted gears in rapid-fire succession from belly-rubbers to jitterbuggers, sitting in those crowded aisles might have been deadlier than a Who arena show marred by trampling casualties. So dense was the stampede back and forth from tables to dancefloor that I could almost hear the mounted Cajun cowboy’s cry of “Hippy Ti Yo!” riding herd on the rug-cutters running furiously pell-mell to relive their youths with every frenzied dance step. Anyone familiar with the Ponderosa Stomp needs no introduction to the legends who graced the stage at the Starks VFW that night. Tommy McLain, the benevolent leprechaun-like John the Baptist figure in a frosty-white beard, still singing with the voice of an angel after all these years. Charles “Red Red Wine” Mann, emoting intensely on-stage like a cross between Jerry Lee’s preacher cousin Jimmy Swaggart and soul master Otis Redding. Willie “Tee”, a gentle bear of man with a Satchmo-like gravelly voice and a growling sax. 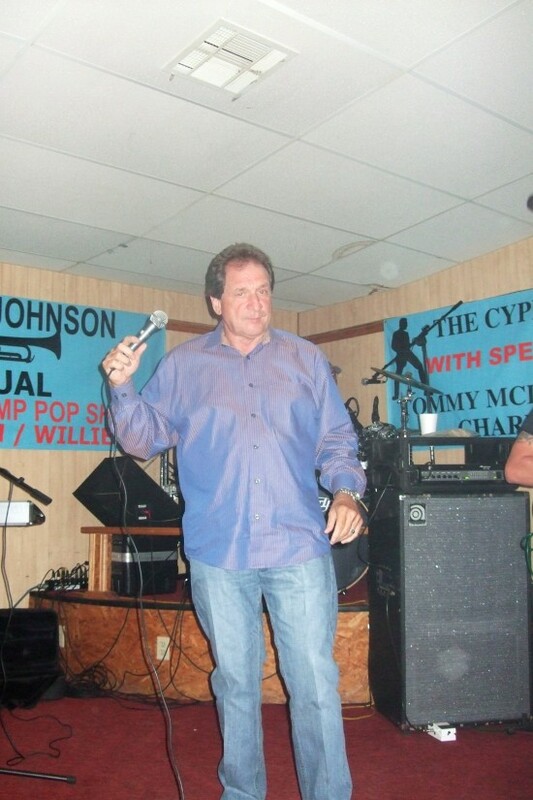 TK Hulin, whose uncannily youthful rock-star looks and authoritative Tom Jones aura fuel his nonstop dynamic stage presence as he belts out the unforgettable chorus to “Alligator Bayou”: “I’m a good-time, hard-lovin’ Cajun man.” Truer words were never spoken. 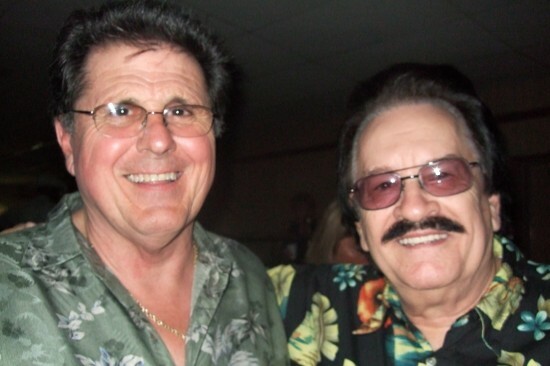 And then, certainly the Caucasian equivalent of Lazy Lester in the Ponderosa Stomp pantheon of music giants: Warren Storm, who can dub himself “The Godfather of Swamp Pop Music” without anyone batting an eye, so deep is the stentorian soulfulness of his bayou wail and pleading, tremelo-like vocal quaver. 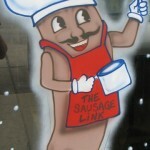 At 70-something, we can forgive him for not pounding the skins that night. We also don’t bat an eye at the notion of driving practically to the Sabine River Turnaround to see this atomic bomb from Abbeville delivering the goods one more time. And let’s not forget the backing band, Cypress, who brought .44 Magnum musical firepower to befit the occasion—and each member a card-carrying coonass to boot. Many touring swamp-pop legends find themselves stuck with mediocre pickup bands playing without benefit of rehearsal. Not Cypress. Honing their chops as Storm and Tee’s regular outfit on at least eight gigs a month, these minstrels are well-versed with the stars’ material as well as each other. Composed of two relatively youngish bucks on bass and drums (Scott Broussard and Kyle Dugas) and two more seasoned veterans on keyboard and guitar (Karl Bordelon and Tommy Richard), the Cypress band galloped along like a frisky quarterhorse at a Cajun bush track—a sure bet at any big race. Bordelon even picked up the trumpet on occasion to sound a few Gabriel’s notes, no doubt as the night’s honoree, Jack Johnson, smiled down from Swamp Pop Heaven. As the evening wore down, it got to be crying time again as we paused to reflect on Jack Johnson. Over muffled tears and blinding flashbulbs, we took pictures of Jack’s survivors posing with a framed portrait of the trumpeter that had been signed by all the swamp-pop legends on the bill. Through whiskied breath I tried to coax some smiles out of the siblings, reminding them that this was Jack’s party and he would want the occasion to be a festive one. They did their best to comply. And though the show was almost over, Warren Storm had one more special performance to give: He spent a good 20 minutes reading off the winning numbers for the parade-of-prizes raffle tickets that had been sold. At my request, he even read off a few numbers in his native French tongue. 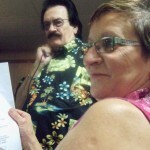 This is a musician who—if there were any justice in this stinking world—will be enshrined in the Rock and Roll Hall of Fame, along with the rest of his swamp-popping peers, and there he was reading off the winning digits at the Starks VFW before launching into his final set and driving back to Lafayette in the wee hours. That’s the utter epitome of class and showmanship. 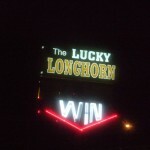 What a scintillatingly brilliant night of music it had been, yet there was still one more little divine pot of gold waiting at the end of this rainbow: the Lucky Longhorn motel in Vinton, an arm of the Texas Longhorn Club complex. Part truck stop, part motel, part restaurant, part casino, part laundromat, this cozy little oasis just off I-10 can meet every weary swamp-pop fan’s traveling needs. And with your choice of shower or Jacuzzi, you’ll find more than a little lucky respite there as you lay down to sleep and dream those “Sweet Dreams” of your next magical musical mystery tour. Talk about a happy ending. Yeah you right, baby.